The mission of Sustainable Organic Integrated Livelihoods (SOIL) is to promote dignity, health, and sustainable livelihoods through the transformation of wastes into resources. We achieve this through developing social business models around ecological sanitation (EcoSan), a process in which nutrients from human wastes return to the soil rather than polluting fresh water resources. People that are empowered to transform wastes into productive resources for our world. SOIL is driven by a philosophy called Liberation Ecology. Influenced by both the liberation theology movement and ecological theory, Liberation Ecology recognizes that the most threatened and marginalized human beings will generally be found living in similarly threatened ecosystems. SOIL seeks to empower the marginalized and oppressed, equipping them to restore their environments by transforming dangerous pollutants into valuable resources. SOIL puts this philosophy to action through livelihood creation in the sanitation sector. Our social business models follow the EcoSan cycle, creating jobs along the way that ensure our impact is truly lasting. From the construction of EkoLakay and EkoMobil toilets, to selling compost, to harvesting more crops, we are creating new value chains that are far-reaching and supportive of life’s most crucial daily necessities. SOIL’s mission is to promote dignity, health, and sustainable livelihoods through the transformation of wastes into resources. Sasha Kramer and Sarah Brownell co-found SOIL. They build the first composting toilet in Haiti, in the northern town of Milot. SOIL builds the first waste treatment facility in Haiti – a composting waste treatment site in northern Haiti. The facility processes waste from SOIL’s public toilets in several communities around the northern city of Cap-Haitien. On January 12th, Haiti is rocked by a 7.0-magnitude earthquake. A team from SOIL travels to Port-au-Prince to help with the emergency relief effort. SOIL’s subsequent emergency sanitation program earns international recognition for being a safe, cost-effective, user-approved, environmentally-friendly emergency sanitation response. SOIL celebrates the first sale of EcoSan compost in Haiti. SOIL’s first customer, the Parc Izmery Camp Committee, purchases compost (that they helped to produce in their emergency toilets!) to transform the park from a tent camp back into a soccer field. SOIL publishes The SOIL Guide to EcoSan to help people around the world replicate SOIL’s successes. SOIL launches a household toilet social business pilot to create a sustainable model for providing sanitation services in the world’s most impoverished communities. SOIL wins first prize in the Land for Life Award, using the award to expand our experimental farm and research center in northern Haiti. SOIL makes a historic sale of EcoSan compost to Brana, the Haitian Heineken subsidiary, which plans to distribute the compost to local growers. SOIL wins the People’s Choice Award in the Nature Conservancy recognizing SOIL’s use of EcoSan technology to help vulnerable communities reduce environmental risk and adapt to climate change. SOIL Executive Director Sasha Kramer is named a Schwab Social Entrepreneur of the Year for SOIL’s groundbreaking work to develop a sustainable sanitation model in Haiti. SOIL’s EkoLakay household toilet social business expands to Port-au-Prince to meet the increasing demand for affordable, sustainable sanitation services. SOIL sells out of compost! SOIL opens a new lab in Port-au-Prince. SOIL opens a new composting site in Port-au-Prince. Sasha Kramer, SOIL’s Executive Director, is selected as an Ashoka Fellow. SOIL responds directly to the devastation caused by Hurricane Matthew. SOIL wins the Energy Globe Award for Haiti. SOIL celebrates its ten year anniversary. EkoLakay reaches 1,000 customers in Haiti! Research indicates SOIL’s compost is often more effective than chemical fertilizer counterparts on core crops in Haiti. SOIL nearly doubles waste treatment operations in one year and breaks ground on composting site expansion project in Cap-Haitien. Sasha Kramer and SOIL win the 2017 Sarphati Sanitation Lifetime Achievement Award. Customer satisfaction survey shows that over 90% of EkoLakay users report the sanitation services is affordable and has improved the health and safety of their families. SOIL is selected as a finalist for the ReSource Award. SOIL primarily focuses on promoting the use of ecological sanitation (EcoSan), a process by which human wastes are converted into valuable compost. EcoSan simultaneously tackles some of Haiti’s toughest challenges by providing sanitation to people who would otherwise have no access to a toilet and producing an endless supply of rich, organic compost critical for agriculture and reforestation. Working with communities to design and test ecologically and socially beneficial solutions, SOIL implements low-cost technologies that are simple, easy to replicate, require minimal water, and provide safe and dignified access to sanitation. Imagine having no option but to endanger your family’s health and poison your environment every time you had to use the bathroom. This is the reality for over 75% of Haiti’s population who lack access to safe sanitation, and it’s where SOIL’s work began: with simple, safe, eco-friendly composting toilets. SOIL is working to transform conditions in Haiti with both short-term projects that address critical needs, as well as a long-term strategy to expand sanitation access through the development of social business pilots, with the goal of designing, implementing, and disseminating globally-replicable models that bring affordable sanitation services to vulnerable urban communities around the world. Through EkoLakay, SOIL’s household toilet social business pilot, customers pay a small monthly fee for a locally-made EcoSan toilet in their home, which is serviced by SOIL each week. The service includes collecting full waste receptacles and replacing them with empty sanitized ones, as well as replenishing a supply of cover material (used for “flushing” a dry toilet). Want to learn more? 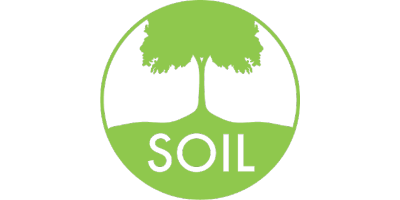 Check out this page about SOIL’s dedication to innovation. EkoMobil is SOIL’s portable toilet social business pilot. Using both traditional portable toilets retrofitted to use EcoSan, as well as original models made with local supplies, SOIL provides safe, dignified EcoSan toilets and waste treatment services for community events, construction sites, and other activities around Haiti. These toilets help SOIL earn revenue critical for operating public toilets while also demonstrating the desirability of EcoSan toilets to a larger market base in Haiti. Please contact SOIL to request a quote for EkoMobil rentals for your event. Too often, sanitation development projects start and end with toilets. But without safe waste treatment, water supplies are contaminated with dangerous pathogens from human waste. This pollution is downright deadly: globally, diarrhea is the second leading cause of death in children under five, and in Haiti, a country of just over 9 million people, 10 children die every day from water-borne illnesses. SOIL employs ecological sanitation (EcoSan) to safely treat and transform human waste into rich, fertile compost – a process that is affordable, sustainable, and ecologically-sound. Furthermore, it shifts the paradigm from a primarily destructive aim (i.e. killing pathogens that make people ill) to a productive one, whereby human wastes are transformed into a valuable resource for the environment. SOIL transforms hazardous wastes into an amazing resource, one that is desperately needed in Haiti: rich, organic, agricultural-grade compost marketed locally as Konpòs Lakay. Though the country was once one of the most agriculturally-productive countries in the world, today the soil is so stripped of nutrients that it cannot produce enough food to feed Haiti’s population. SOIL is working to revive local agriculture by promoting the use of compost and other sustainable methods. SOIL’s agricultural team conducts studies on the use of Konpòs Lakay in order to improve local farming practices and maximize the economic benefits of targeted compost application. This data is helping SOIL expand the market for Konpòs Lakay, which in turn supports the sustainability of SOIL’s sanitation programs. SOIL is committed to sharing our knowledge and resources, because we know that when more people are empowered through education, we can accelerate change and achieve our vision. SOIL’s outreach encompasses everything from educating members of our communities on health and hygiene to coordinating a national Sustainable Sanitation conference for key players in the sanitation sector. For those interested in learning more about EcoSan, SOIL provides periodic open training workshops as well as a the wealth of online resource.